Baby Lady and I have been traveling and working a lot. 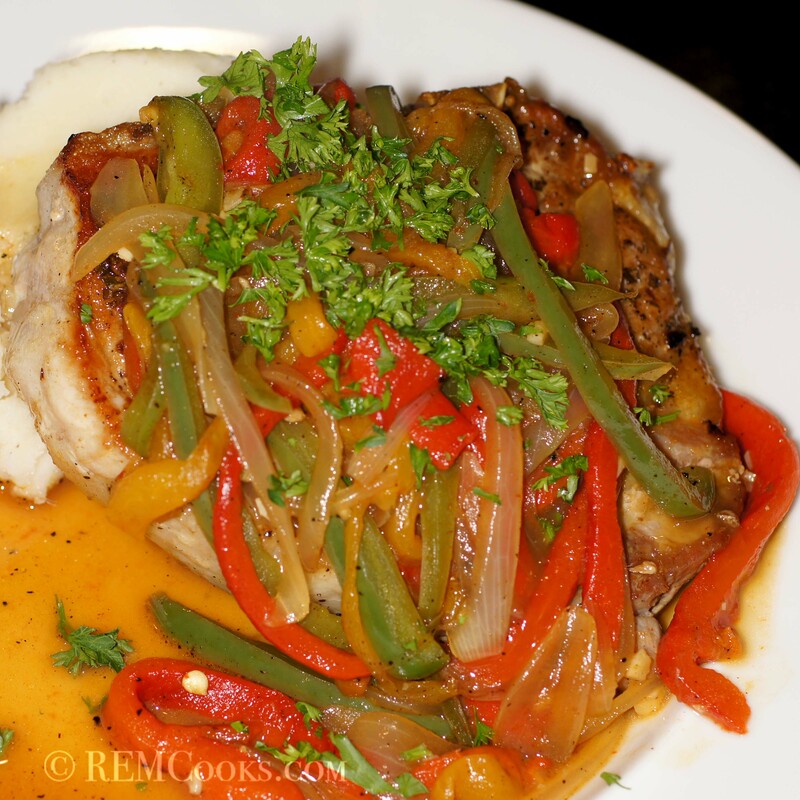 While it kept me from posting, it did not keep me from eating good food like this beautiful Pork Chop Scarpariello. What is scarpariello you ask (at least I did)? Scarpariello means shoemaker-style. Hmmm…someone actually named a dish shoemaker-style. I don’t know about the rest of the world but when I think of shoemaker I think of leather, rubber and stitching. Also, one of the worst things you can call a French Chef is a shoemaker. But this is an American Italian dish so it matters not what the French say. Shoemaker-style despite its connotation of tough and leathery also implies common food, what others more sophisticated might call peasant food. Maybe the name originated because it was “cobbled” together from foods common to a poor man’s table. Well, let me set the record straight. 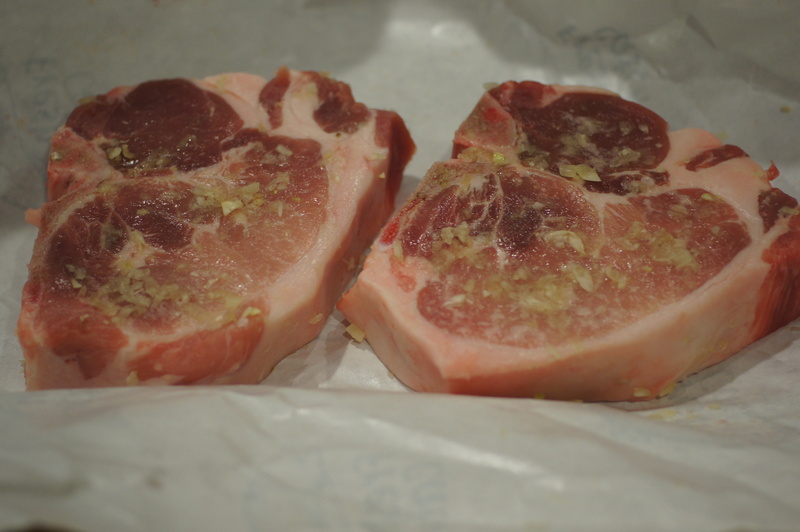 Pork Chops Scarpariello may not have the greatest name in the world but it is neither leathery nor tough. Neither is it food for unworldly peasants. Whoever came up with this combination of ingredients created a masterpiece. 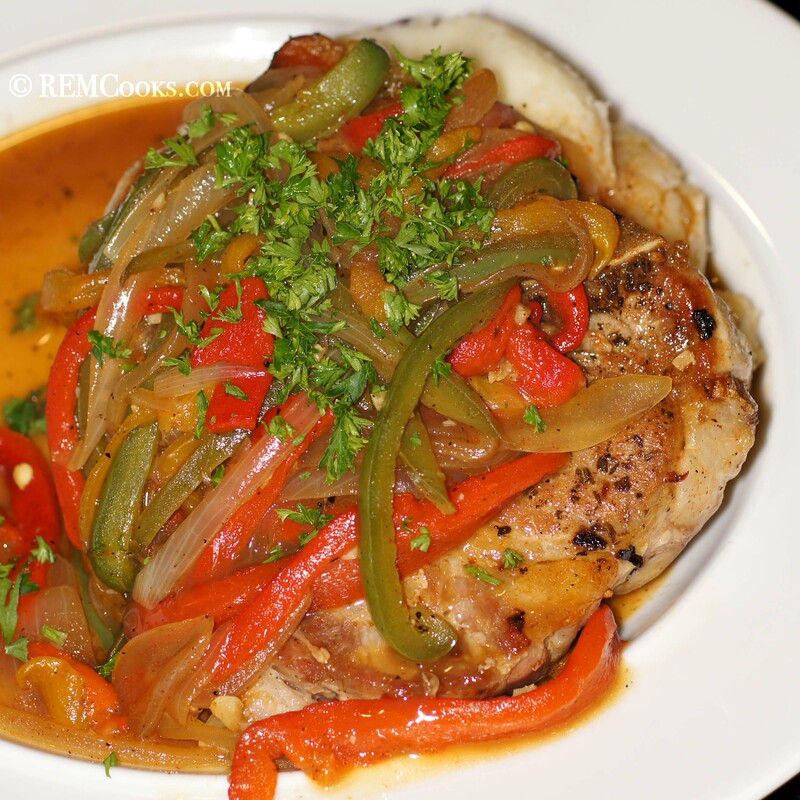 This dish has tremendous flavor, aroma, character, beauty and is fit for a King. When you’re looking for something new to do with pork, give this a try. Roast the bell peppers. Roasting peppers is shown in Stuffed Roasted Red Chile a la Richard. Peel, then halve lengthwise, discarding stems and seeds. Cut peppers into 1/2 inch slices lengthwise. While peppers stand, mince and mash half of garlic to a paste with 3/4 teaspoon salt. Smear on the pork chops. Combine with rosemary, 1 tablespoon oil, and 1/2 teaspoon pepper. 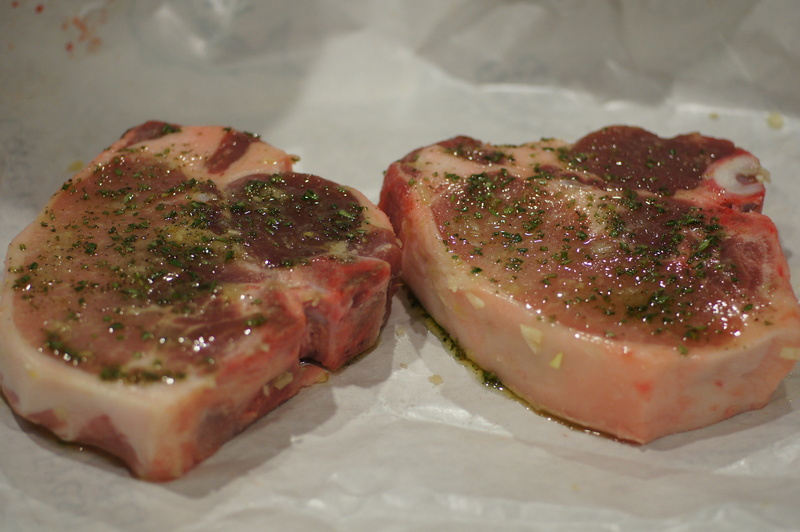 Brush onto chops and let sit for 30 minutes. Heat remaining 2 tablespoons oil in a large heavy nonstick skillet over high heat until it shimmers. 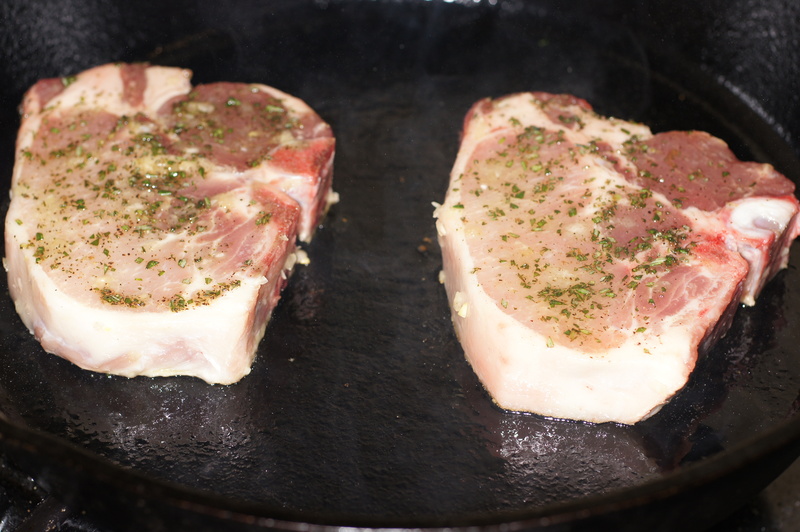 Add chops to the skillet and reduce heat to medium. 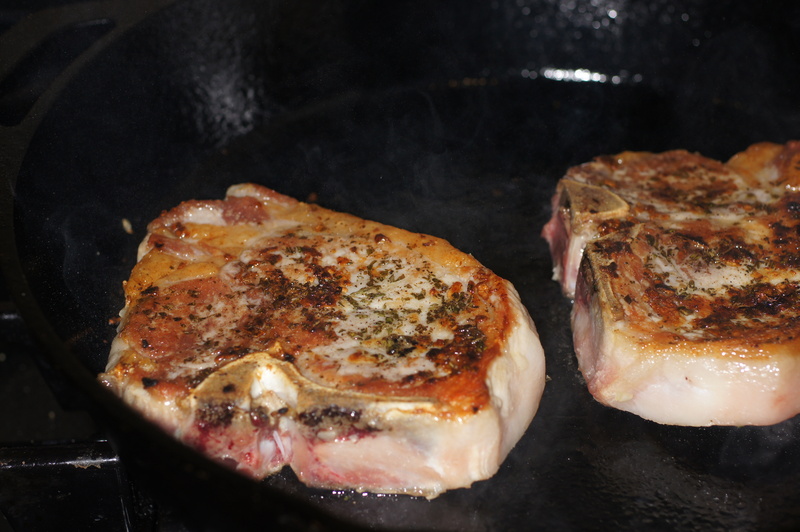 Cook chops turning once, until beautifully golden and just cooked through, roughly 4 minutes per side. Remember, all stoves/ranges have temperature adjustments for a reason. 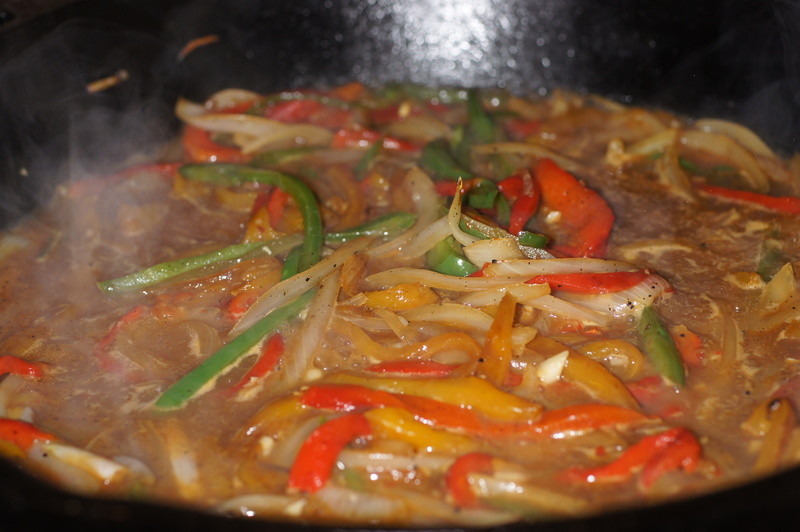 Heating the skillet to high heat to heat the oil and the skillet will quickly sear the meat. Dropping the temperature to medium allows for longer, slower cooking to enable caramelization of the sugars without burning providing you that nice golden crust you want. Transfer to a plate and keep warm, loosely covered with foil. 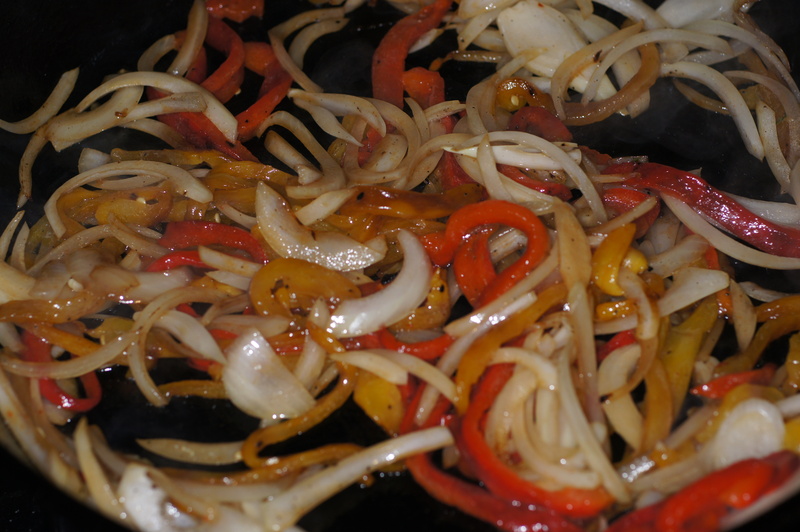 Add roasted peppers to skillet with onion, and 1/4 teaspoon salt. Cook, stirring occasionally, until onion is softened, 5 to 6 minutes. 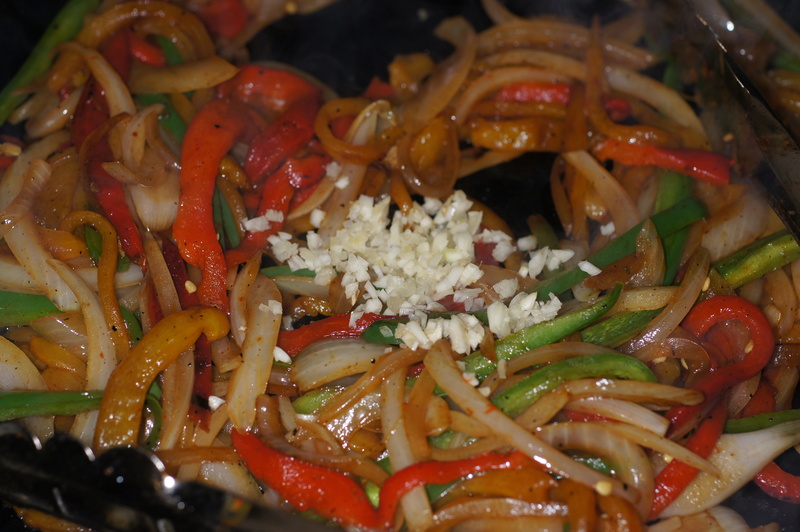 Add the jalapeños and garlic and continue to cook another 2 – 3 minutes so as not to let the garlic burn. Add wine and broth and boil until liquid is reduced to a glaze, about 5 – 7 minutes. Add meat juices from plate and remove skillet from heat. Add butter, stirring until incorporated. Stir in lemon juice and adjust seasoning of salt and pepper to taste. To plate, put a mound of mash potatoes in the plate. Place the chop on the mash potatoes at an angle. Spoon sauce with veggies over the chop. Garnish with parsley. Serve and enjoy. Sounds and looks wonderful, I love a good pork chop. This sounds DELICIOUS! An interesting melding of flavors. Sounds Kinda like an interesting blend of my Smothered Pork Chops and Swiss Steak. I look forward to trying this! Thanks! Thanks for dropping by and your nice comment. If you do try it, please let me know what you think.